So it’s been a little while! I have a lot going on in my personal life at the moment. Sometimes it’s difficult for me to juggle so much at once. I really am going to try and get back to my 2-3 weekly posts though. I really have been doing a lot behind the scenes. It just hasn’t made it to the blog yet. It’s coming! 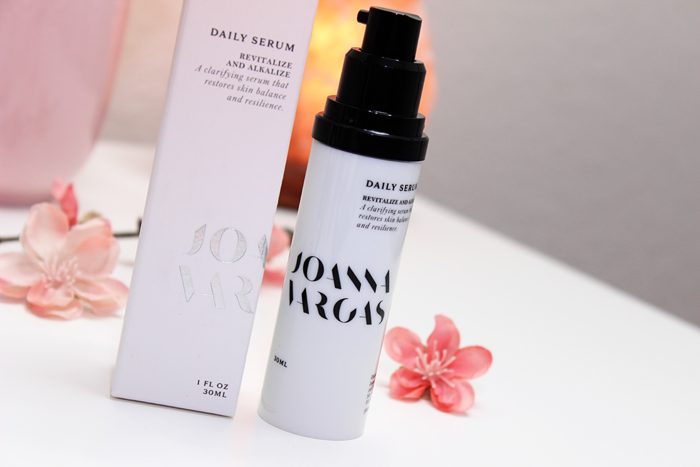 Right now I’m going to talk about this Daily Serum from Joanna Vargas. Joanna Vargas is a celebrity facialist. She has a salon in New York, NY and one in Los Angeles, CA. She also has a line of skin care products that you can purchase online. 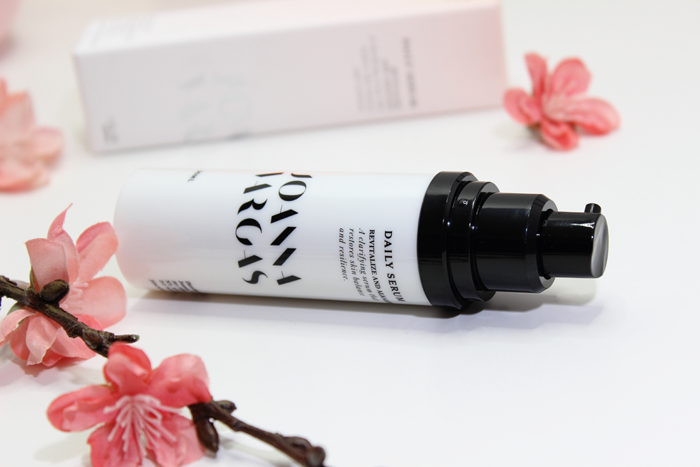 The Daily Serum is a clarifying serum that restores skin balance and resilience. They say it’s the green juice for the face. It claims to be lightweight and super hydrating. It’s a revitalizing formula that blends a variety of antioxidant-rich botanical elements to repair and prevent the visible signs of aging. Let’s take a look at some of the key ingredients. To use, after cleansing gently pat 1-2 pumps into dry skin. I’ve been using this serum every single day for a little over a month. Here are my thoughts. First, I’d like to note that I only apply it once a day as part of my nighttime routine. However, they claim it can also be worn under makeup for daytime wear. I find that 1 pump is more than enough for me. It’s fairly easy to get 1/2 pump out for a little extra though. I can see why they call it green juice with its light green color. I did detect a scent and it took a while for me to figure out what it reminds me of. Orange Julius! It’s not bothersome at all. I found it to be nice and refreshing. It truly is nice and lightweight. It absorbs pretty fast and leaves my skin feeling soft. I also notice that it evens out the redness on my cheeks a bit. After a few weeks I noticed that the dry patches on my skin vanished. 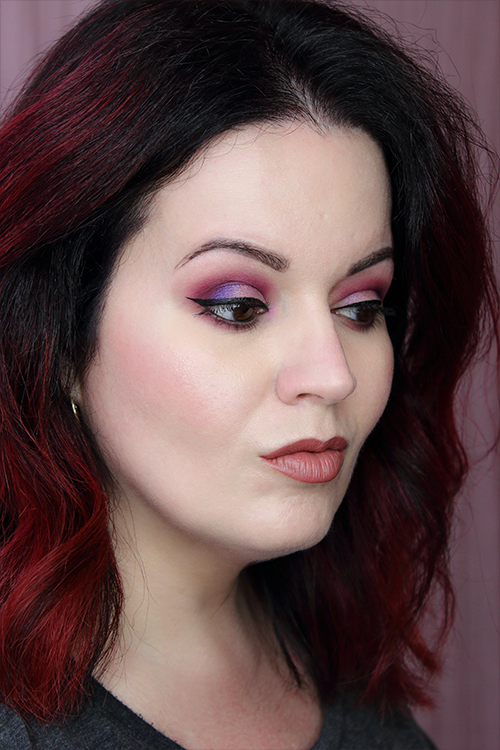 At some point the line in the middle of my brows wasn’t as noticeable. The same goes for the fine lines around my eyes and mouth. My skin feels firmer and looks brighter. I definitely notice a difference in my skin after using this serum. And it played nice with my super sensitive skin. I didn’t experience any issues. This truly is a great serum! I’m very impressed with the results and I’ll definitely purchase a bottle once I run out.